We usually begin by placing the rice water in a covered pot on the stove top, and allowing it to come to a boil while preparing the other ingredients. When the rice water comes to a boil, add the rice, cover the pot, and reduce the heat to low and simmer. When all the water has been absorbed, turn off the heat. We usually prepare this recipe in our microwave oven, because of its speed and ease of preparation, but it can also be prepared in a wok, or in a pot on the stove top, or even in a conventional oven. Wash, peel and dice the onions and add to a large covered microwaveable dish. Add the hot pepper to taste and mix. Cook until the onions become semi transparent. While the onions are cooking, begin the preparation of the beets. 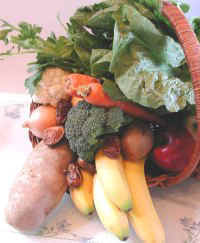 Thoroughly wash the beets and greens, and remove any bad spots. It is usually easier to cut the leaves off of the beet root. When clean, dice or chop the leaves and cut the beet roots into small bite sized cubes. 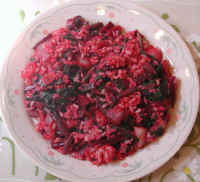 Add the beets and greens to the cooked onions, cover and cook until tender. Add the cooked rice and mix all the ingredients together. 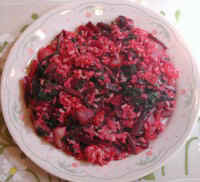 If the rice is still hot, the beets and rice are ready to serve and enjoy. If the rice has cooled, the combined ingredients can be placed back in the microwave for a few minutes to be reheated. This recipe is also great as a left-over. 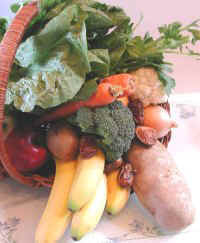 Just store in a covered container in the refrigerator, and warm in the microwave the next day. We usually save the left-overs in the covered dish we used for preparation.